How Your Makeup Can Survive the Humidity and the Heat! Unfortunately, with the heat and humidity, our faces tend to get oily…and you all you ladies know what happens when your face gets oily! Two words: Make-up. Ruined. Let me give you some tips that will end this horror! You will have to bear with me because this is a multi step process, but results are guaranteed! Good news is some of the steps might not apply to you. 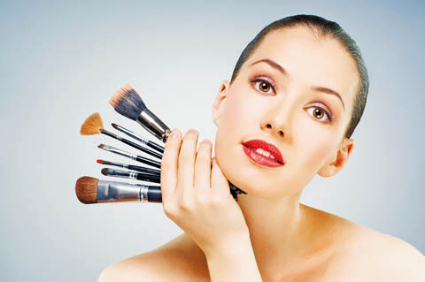 The crucial steps to get your makeup to stay on all day are steps 2, 4 and 6. After you have washed your face and applied your toner, I recommend using a matifying cream. Although, if you already have a day cream that you like, you can simply put the matifying cream on you T-zone and your other cream on the rest of your face. 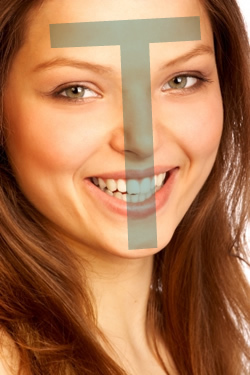 Your T-Zone includes your forehead, nose and chin. Apply a primer base on your face, concentrating on the T-zone and your cheeks. If you do wear foundation, now is the time to apply it. For optimal application, use a foundation brush. I recommend using a light, oil-free foundation. On top of your foundation (or base if you don’t wear foundation), apply a matifying powder concentrating on your the T-Zone. Apply your favorite blush. An easy way to apply blush is simply to smile and apply the powder to your cheeks. Now, to fix your makeup in place, spray your face with a setting spray. One spray to the left of your face, one to the right of your face and one in the middle. As mentioned before, there are a lot of steps, but half of them you most likely already do. Once again, the crucial steps are 2, 4 and 6. The steps are important to know so that you know in what order to apply these products. If you do all of the steps, your make-up will stay flawless all day or all night! Results are guaranteed!